Not many of us have been a big fan of the IPL this season. Not giving us cricket-buffs even a week’s gap between the World Cup and the IPL was blasphemy, especially after India won the World Cup. Probably, the commercial and the glamorous elements of the IPL eluded the organizers from giving us more time to rejoice, after all this is a multi-crore extravaganza with very little cricket remaining in it. The lines were drawn. There were 10 teams. Most of us vouched for the team from the city/region we belonged to, or the team that had a star player. #ForSachin was a big key for a majority of us to support the Mumbai Indians. Dhoni’s World Cup triumph was a huge factor for people to support Chennai Super Kings. The recent addition of ‘Dada’ into the Pune team was a reason for a few of us to get back to watching this season of the IPL, and he sure didn’t disappoint. For me, IPL has always been about the support for The City. Whether the team is playing well or not, whether the Liquor Baron had players from The City in the team or not, or whether the team was disjoint/disorganized or not, didn’t seem to matter to me. At the beginning of this season, I seriously thought if I really had to support this disjoint team, whose whole was lesser than the sum of its parts. My love for The City forbade me from doing so. If you call it lame, please read the PPS below. It’s amazing what your love for a city can do to you. It turns you back into being a fan of the game once again, after you gave up following the match-fixing drama. And not to mention, my sleep-vaas still continues, but it’s rather a forced one, thanks to the unearthly hours that the matches take place. And the team strikes back! The team with the Gayle-Kohli effect had found something in itself. Better late than never. And whether the team makes it to the play-offs or the final or wins the IPL this season, or not, is quite immaterial. And I can’t wait to wear my jersey soon! 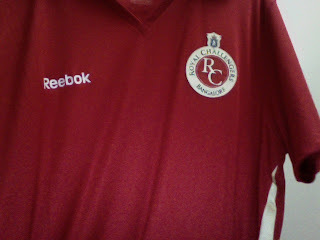 Go RCB! PPS: If you think this support is lame, then why you shed tears of happiness when India won the 2011 World Cup semifinal and the finals? Tell no, tell no? I think deep down, everybody has a team he/she is supporting, or likes more than other teams. I can understand people getting bored of IPL due to excess cricket, but cannot understand those who dismiss it altogether as 'non-cricket'. Give it some time, and I am sure the league will grow and address all the issues, including matchfixing, around it. Supporting the home team is but natural like supporting the home food. Home is where the heart is. Well-written post. PPS:This @localteaparty-style English is getting popular! hello saar, you are wanting to wear the ugly-kachda- green colour jersey na? i will send from here, if you want means. RCB ge jai! For two months in a year, being reginonalistic doesn't matter! And quite generous of the other teams to help RCB get lucky. @Shashank - Nerdiness in other blogs? That's news to me :-) And, thank you. @krack - Thank you. And @localteaparty is certainly influential.